Certified 100% USDA Organic (SDG) Lignans from Flaxseed Hulls For Women Cold Milled Processed, Non-GMO, Gluten Free. Vegetarian capsules. 180 count bottle. Two capsules per serving. 30 mg of organic SDG lignans per serving. Each capsule contains 100% flaxseed hulls. 180 capsules in each bottle for a 30 day supply. Lignans are phytoestrogens. Phytoestrogens are cleaner versions of estrogen and have similar biological effects as your naturally occurring endogenous estrogens. Dr. Oz recommends flaxseed lignans on his website. 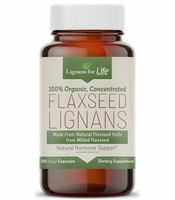 As stated on his site, www.doctoroz.com, Flax contains lignans. The lignans alter the way your body metabolizes estrogens into safer forms. All natural, organic flax seeds are hulled to provide ground concentrated flax seed hulls packed in a vegi capsule. 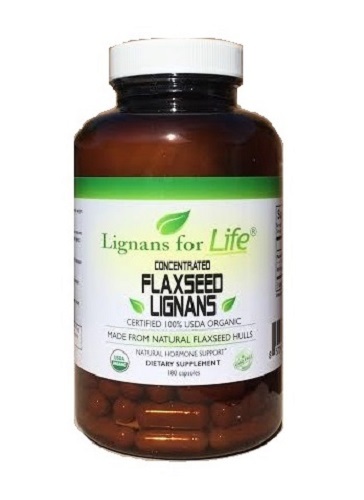 Each serving (2 capsules) contains 1380 mg of flaxseed hulls and 30 mg of SDG lignan. Each bottle provides a 30 day supply. Recommended dosage is 2 capsules 3 times per day (6 caps per day), for a total of 90 mg of SDG lignans per day. Lignans have hormone balancing properties. Lignans are phyto-estrogens (plant estrogens) that mimic normally occurring (endogenous) estrogen. Lignans balance estrogen levels to help support breast health. They bind to estrogen receptors, but with less biological effect. The high amount of fiber in flaxseed lignans also helps support colon health. Lignans have been indicated for a variety of other benefits, such as heart, cholesterol, and hair health and menopause treatment. What's the difference between this product and regular flaxseed? Regular flaxseed contains the embryo of the seed, which is where the oil comes from. Our product contains only the hull of the flaxseed, where all the benefits reside. Our flaxseed lignans contain a higher amount of lignan than regular flaxseed. Treatment for Menopause and Perimenopause. Lignans may be one of the best natural menopause treatments available. As a phytoestrogen, they can decrease uncomfortable menopause symptoms (1). Lignans are one of the best natural remedies for hot flashes and are also effective for women experiencing the symptoms of perimenopause. This is a result of the lignan's hormone balancing properties. They can aid in treating menstrual irregularity and they not only reduce the frequency of hot flashes, but their intensity as well. Before the onset of menopause, women may experience perimenopause symptoms. Perimenopause, sometimes referred to as premenopause, is a transition period that can happen several years before the onset of menopause. As time passes, a woman�s ovaries will gradually produce less and less estrogen. Lignans help to restore the balance as the body undergoes such changes. Lignans are a phyto-estrogen (plant estrogen) and can supplement your natural endogenous estrogen. Perimenopausal symptoms can include mood changes, menstrual irregularity, hot flashes, difficulty sleeping and a decrease in fertility. Menopause symptoms can begin as the decline in estrogen production becomes greater. Menopausal symptoms can include hot flashes, night sweats, fatigue, decreased libido, dryness of the mouth, vaginal dryness and trouble sleeping. Also with menopause comes the complete cessation of menstruation. Lignans are among the best natural remedies for both perimenopause and menopause (2). Postmenopause occurs in the years following menopause. It is possible that energy and emotional levels may be stabilized, but lower estrogen levels put women at risk for heart disease or osteoporosis. In some cases, estrogen levels may actually increase with menopause or in post menopause. Lignans can help women in this stage of life due to their ability to balance hormones and raise natural estrogen levels by competing with progesterone. When too much estrogen is present, lignans (which mimic estrogen) bind to estrogen receptors. Excess endogenous levels of estrogen are then excreted from the body either though urine or the bowels. When not enough estrogen is present, the lignans also bind to estrogen receptors and exert their weak estrogenic effects, augmenting a woman�s low level of estrogen. Lignans (phytoestrogens) can be used as a natural hormone replacement treatment and are much safer than conventional hormone replacement treatments. Studies have shown that lignans can be very effective as a natural menopause treatment because, as a phytoestrogen, plant lignans can safely alleviate menopause symptoms without the use of chemicals (5). Out of all menopause symptoms, one of the greatest changes that lignan users have reported is the reduction of hot flashes (both in intensity and frequency). What causes hot flashes is the reduction of estrogen, which may upset the functioning of the hypothalamus (the body�s temperature regulator). It has been reported that, thanks to their regulation of hormones, lignans can decrease hot flashes by over 50%. Lignans are a natural way to regulate hormone changes during menopause and in doing so, they can lighten other menopause symptoms such as night sweats, thus providing significant menopause relief. A recent clinical study that set out to determine whether or not lignans can be effective in treating menopause symptoms found that lignans can reduce hot flashes in as little as four weeks. Just 3 servings (6 capsules) of our flaxseed hulls each day provides 90 mg of flaxseed lignans, which supply the body with ample hormone balancing effects. A mere 6 capsules are sufficient to increase lignan levels in the body to levels equivalent to test subjects. Lignans mimic estrogen in a natural and pure way so naturally occurring estrogen is much safer for the body. Increasing fluid levels along with the lignans is also highly recommended to achieve maximum relief. In another Mayo Clinic study, women experiencing hot flashes took flaxseed (high in lignans) for six weeks. At the end of the study, they reported better moods, decreased sweating and a lessening of joint pain. They also reported that the amount of hot flashes they had been experiencing, as well as the severity, was cut in half. Another recent study on the diets of Asian populations versus the diets of western populations reported that the Asian population, with a diet rich in phytoestrogens, had a considerably decreased rate of menopause symptoms, osteoporosis and hormone-dependent cancers compared to westerners. For menopause symptom relief, take about 1 mg of lignan for each pound of body weight per day. 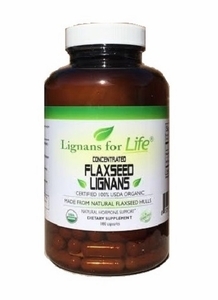 For our 30 mg flaxseed lignans, take 3 servings (2 caps per serving) for a total of 6 capsules per day. Always drink plenty of water (a full glass) with your lignans due to their high fiber content. 1. Adlercreutz H, Hamalainen E, Gorbach S, Goldin B: Dietary phyto-oestrogens and the menopause in Japan. Lancet 1992;339:1233. 2. Israel D, Youngkin EQ. Herbal therapies for perimenopausal and menopausal complaints. Pharmacotherapy.1997;17:970-984. 4 Borrelli F, Ernst E. Alternative and Complementary therapies for menopause. 2010. 5. Weil Valerie P, Cirigliano Michael D, Battistini Michelle. Herbal Treatments for Symptoms of Menopause. Clinical Perspectives in Complementary Medicine. 2000.